Stories about giving and receiving. I always start my storytelling performances by focusing on the circles and cycles that we share. Storytelling is a circle: a story needs someone to speak the words and a listener to imagine the story into being. This vital exchange breathes life into stories as they become animated in our mind’s eye. So the gift of storytelling is a mutual experience – an exchange of wisdom and a mindful act of creation. There is also the circle of our gathering; of giving and receiving; in which everyone is arranged in a shape which symbolizes reciprocity and reminds us that we are all in balance. Whatever we share goes around between us all. The circle is also a symbol our relationship of giving and receiving with the natural world. Everything in nature works in cycles. The basic principles of ecology and sustainable natural processes are based on exchanges of minerals, carbohydrates, genes, gases and other life-sustaining elements. Without this essential mutuality, ecosystems, and the life therein, could not survive. These are the cycles that we must live within in order to endure and preserve the environment for future generations. During this season of gifts and giving, as the days grow shorter, we are offered the opportunity of long periods of time to spend with other people in our immediate spheres of daily interaction: family members, co-workers, fellow teacher and students, members of our secular and faith communities. Now is the time to focus on how traditional family stories, folk tales and the often-told stories from the annual cycles of our spiritual traditions and holidays can enrich and empower these long nights. Storytelling can bring us together as participants in a sharing that can be traced back through the millennia, to a time when the first story was told around a cooking fire as humans of long-ago listened in wonder beneath the sky dome. In many indigenous cultures, the gift always keeps moving it does not stop with any one person. Possession is an honor and is one aspect of the trust between people in that community. Leaders of many indigenous cultures are not respected for their material wealth, they are considered wise, just and generous as evidenced by how little they own. This is a sign that they are putting the well being of the entire community before their own personal gain or the interests of their family. Now is the perfect time of year to rediscover the stories of wisdom that will carry us beyond the narrow perspectives that pervade our particular period of history, and into the light of a new day. The darkness is illuminated by the rays of hope that streak across our hearts and minds whenever we share in the circle of wisdom that is kept alive for each new generation by the art and the joy of storytelling. Michael J. Caduto is an author, educator, ecologist, storyteller and musician who once used CPR to save a chipmunk’s life. In 1984 he founded P.E.A.C.E. “Programs for Environmental Awareness & Cultural Exchange” to promote Earth stewardship and cultural understanding. Michael has traveled throughout North America, Europe and in the Middle East to present performances, workshops and keynotes to more than 250,000 people of all ages. He is known for his mix of poignant and humorous tales as well as his well-rendered characterizations and variety expressive voices. 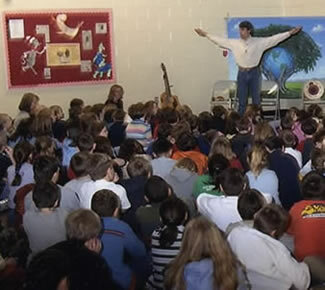 His unique mix of programs on storytelling, science and cultures has captivated audiences of all ages for nearly 30 years. Michael has written and co-authored sixteen books, including the Keepers of theEarth series; Earth Tales from Around the World; The Crimson Elf: Italian Tales of Wisdom; Native American Gardening; Everyday Herbs in Spiritual Life: A Guide to Many Practices; Pond and Brook: A Guide to Nature in Freshwater Environments and A Time Before New Hampshire: The Story of a Land and Native Peoples. Michael’s picture/activity books include In the Beginning: The Story of Genesis and Earth Activities for Children and A Child of God: Stories of Jesus and Stewardship Activities for Children. His awards include the Aesop Prize from the American Folklore Society, NAPPA Gold and Silver Awards, a Storytelling World Award and numerous ASCAP popular awards. He has also received awards for outstanding environmental educator from both the New England Environmental Education Association and the New York State Outdoor Education Association. His CD of music is called All One Earth: Songs for the Generations (ASCAP Popular Award). Michael, who is of Italian and Swiss ancestry, has worked closely with many indigenous cultures. This entry was posted on Monday, December 10th, 2007 and is filed under Environmental Storytelling, Episode List, Storytelling in Ceremony, Storytelling in Community, Storytelling in Schools. You can follow any responses to this entry through RSS 2.0. You can leave a response, or trackback from your own site.